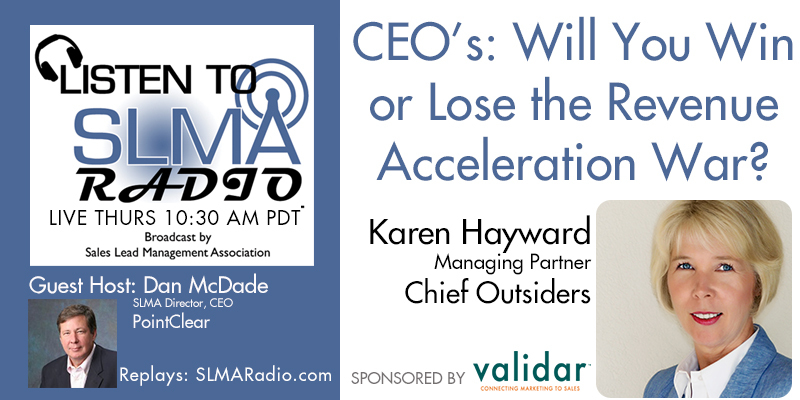 Dan McDade, SLMA guest host and board member, interviews Karen Hayward a managing partner of Chief Outsiders on the subject of what separates winners and losers in the revenue wars. The interview covers three tactical areas that winners use, and loses fail to implement. Very interesting. Because of its market-based growth plans, quality of leadership, and experienced team, Chief Outsiders has been recognized for the past four years by Inc. Magazine as one of the 5,000 fastest growing privately held companies in the US, and was recognized in the Houston Business Journal's Fast 100. McDade has a history of knowledge in the sales lead management and lead generation fields having been the CEO of PointClear for 20 plus years. He is now the managing partner of Prospect-Experience which solves the weaknesses in B2B companies he sought to repair when the leads he created for clients went begging for attention from his clients sales and marketing people.